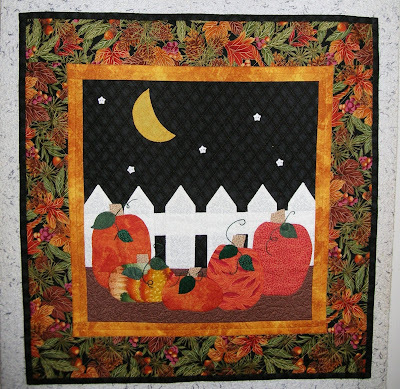 This entry was posted in circle lord, clam shell, fall, fall quilt, halloween quilt, outside plant, pumpkin, snow, weather by Norma Hanson. Bookmark the permalink. It looks like fall inside and out at your place, Norma. Snow, already? It is acting like August down here. 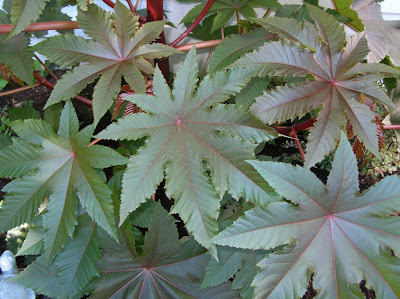 I see the chicken hiding in the plant! Bet you are busy this weekend with your Thanksgiving coming up–Monday, right? I don’t remember seeing that 4 patch strippie on your blog before. Very pretty! Does everyone “fight” over who gets to cover up with it? The punkin 4 patch posie must not be quite redy for hanging but good for you getting the BQ one done just in time for the season. 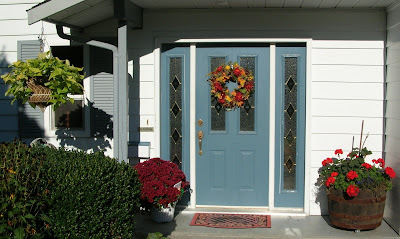 Your house looks cozy and autumny and inviting! I really like the strippy TV-snuggle quilt. That snow does look awfully close!! 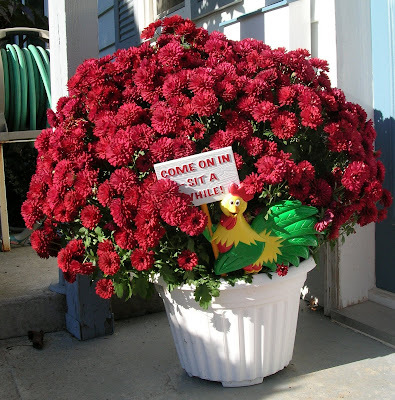 The potted mum that is outside the door is just beautiful!! And such a beautiful colour. 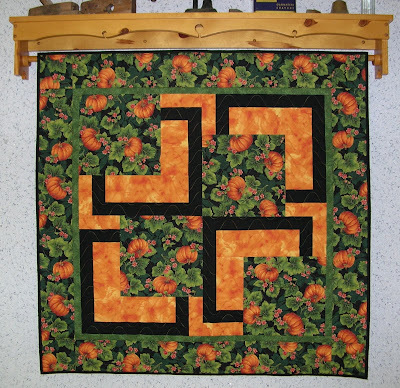 It certainly looks like you are ready for fall with all the quilts around. I remember your posts about last Christmas and New Years. It is hard to believe that another Christmas is almost here!! 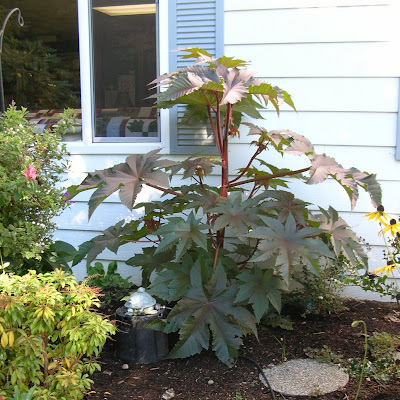 It’s a Lime Green Ornamental Sweet Potato Vine. I have one in the reddish/bronze. Love the little quilts as you enter the house..
fabulous decorating Norma…the chill is being felt here too. Very nice. I like you house especially in the fall. I thought that fabric looked familiar. I certainly like it. I think I would have bought much yardage of that fabric. Thanks for sharing the great pictures. Gorgeous photos of the mountains, Norma. I must get myself a wreath like yours! Just lovely decorating for the season. 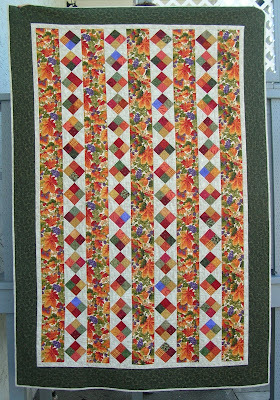 I love all the fall quilts, one of these days I’m going to make one on those colours. 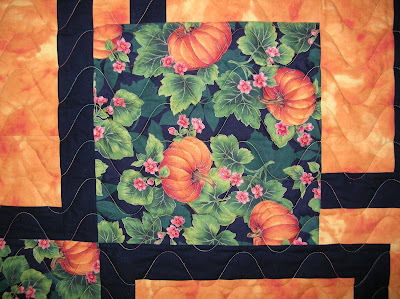 I especially love the new 4 patch stacked posie made with stacked pumpkins! It’s a great pattern and that fabric really works well. Thanks for the “fall tour”! Love the new quilt. Congrats on getting another old one finished. 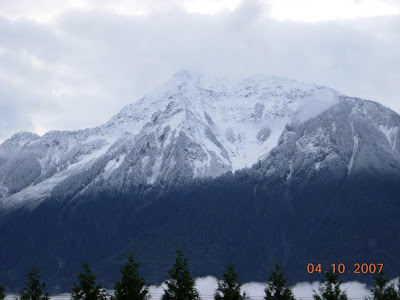 Loved the snow on the mountains – as long as it stays on the mountains now it’s OK, right? Your mums are just beautiful. I’m enjoying seeing everyone’s decorations so much. Thanks to my shoulder we are still looking at summer red, white and blue. Fall probably won’t come out at our house this year. I am very impressed with your fall decor. The snow on the mountains looks scarily close. Yikes. As we drove home from Virden in the rain yesterday we came across as short stretch that was white! Was it snow or hail? Either way, it was a wakeup call. I better get the carrots and potatoes out of the garden! Those snow topped mountains are beautiful. 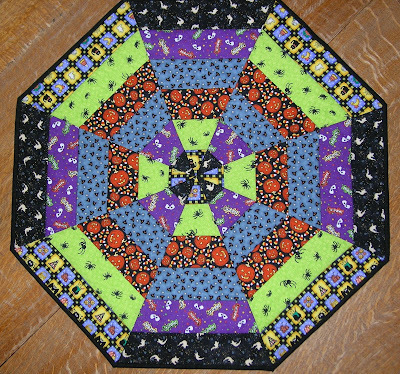 Enjoyed seeing all your pictures of your Fall quilts! 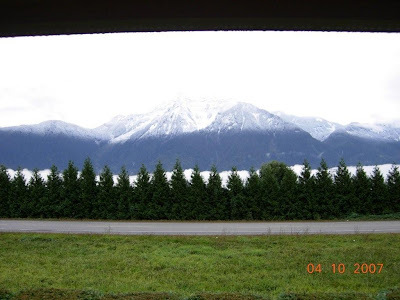 Wonderful pictures of the scenery and great quilts and decor. 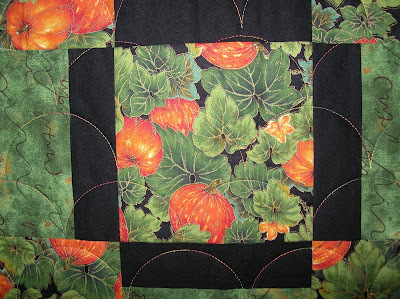 You remind me that it’s time to pull out my Autumn quilts this week too. The weather is supposed to turn cooler tomorrow thank goodness. That’s great bright decorating. Your door looks very inviting. 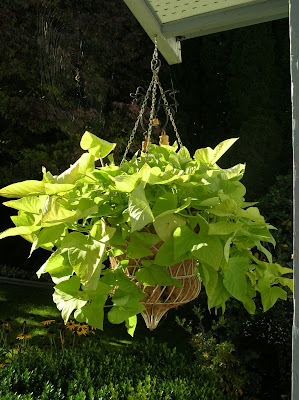 The plant in your hanging basket looks like a Kumara vine/ plant ( sweet potato ). 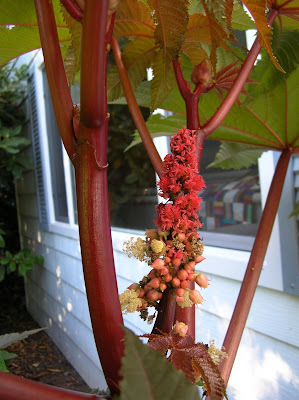 The Castor bean plant is very poisonous so be careful. Very seasonal. I love the wreath. I know what you mean about jumping straight to winter, it feels like that here too. My favorite time of year. Love the photos.. thanks for sharing. Mmmm – I can just feel the crispness of the air . . . thanks for sharing all of your decs – they are just beautiful. What a fun view of fall! It is still so hot here in IL – I’m glad it isn’t freezing – but way too hot for Oct! wow! snow already! I’m ready for cooler weather-it’s been HOT here, way unusual for this time of year. 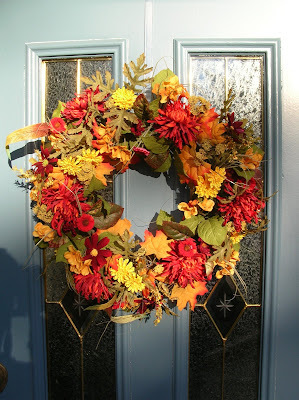 Loved all your fall decorations and especially loved your 4 stacked Posies with the pumpkin fabric–it looks REALLY good! and the strippy one was awesome too. Well, they all are great, thanks for sharing! Thanks for inviting us into your home. Your decorations are lovely…such beautiful quilts!!! Your snowcapped mountains look awesome. You’ll have to check out the pictures that I posted of “my” mountain. Snow?! Yikes! Thanks for the tour of your quilts and your garden. Everything looks beautiful. It looks like a wonderful inviting place to live and visit. Your four patch posies look great too – I really must get to working on finishing mine. It is such a wonderful technique. Aren’t those sweet potato vines with their bright lime green colour the best for garden containers? I have lots of them in mine and they really bring colour to a shady area. 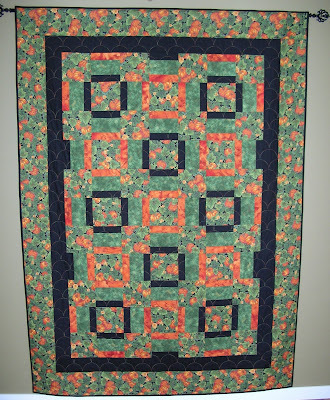 Your quilts are lovely and so perfect for this time of year. We’ve been enjoying Indian Summer days out this way but seeing your snow reminds me to start bringing in some plants. congrats on 400 posts……..sorry I am a little late…. opps sory wrong comment………I meant to say I love your pics of the snow……..I never see anything like this even in the coldest of winter……please show more……..